Gujhiya, Thandai, gulaal and water balloons, everyone together with speakers on full volume, that’s HOLI! Aren’t you already humming Rang Barse Bheege Chunar Wali? Well if, like all of us, you also think your home town has the best holi celebrations, pause because you’re yet to witness the most mesmerizing celebration in the historic Indian city. Yes, I am talking about the fun-filled Holi celebration in Mathura, one of the best experiences you’ll ever have. Take a virtual ride with me and keep your wallet with you ‘coz you’ll instantly book your tickets to Mathura. 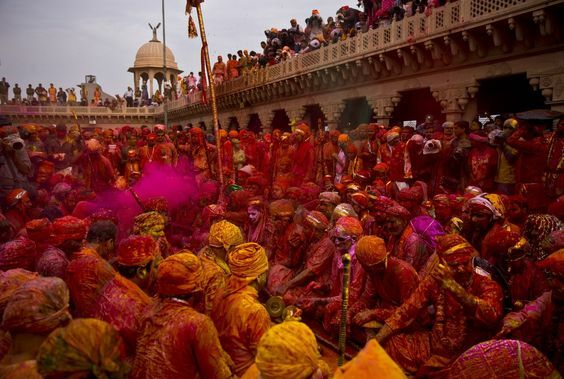 Known for the unconventional celebrations, Holi in Mathura attracts thousands of tourists across the globe to witness the grandeur of Holi celebrations. 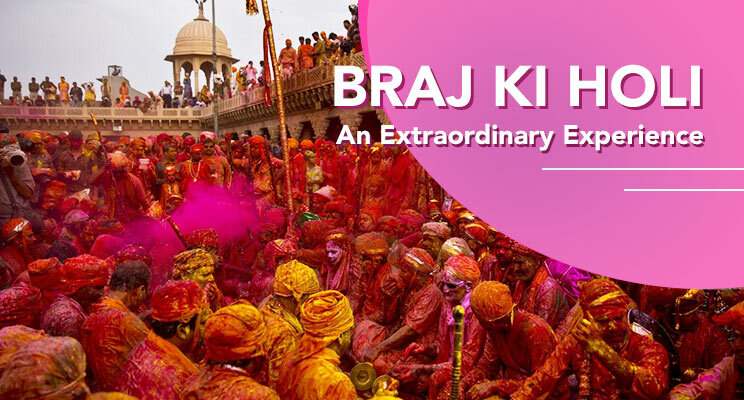 Braj ki Holi isn’t just the most fun festival but also offers an experience of a lifetime. A festival that celebrates love, unity, the triumph of good over evil and paints the world with happy colors, Holi is everyone’s favorite. But Braj ki Holi is a little different than your regular Holi. It’s weird, fun-filled and significant at the same time. Meanwhile, if you are unable to decide what’s on the Holi special menu, here’s a list of scrumptious dishes you can always bank upon. 1. 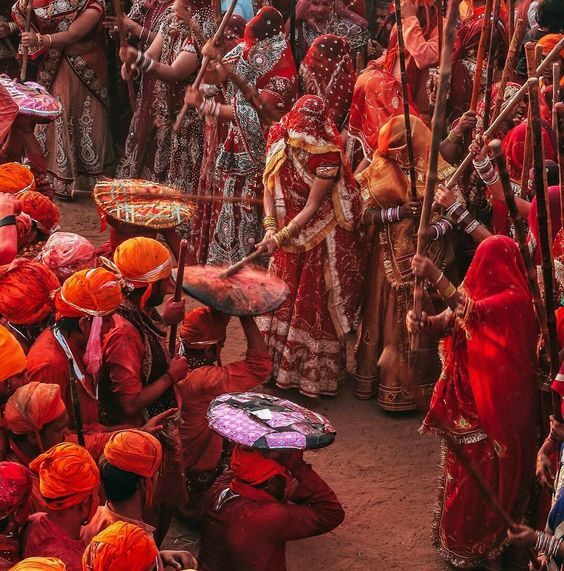 Lathmar Holi in Barsana and Nandgaon – A Fun Game of Sticks and Shields! Legend has it that the eternal love story of Radha and Krishna started in Braj. Krishna and his friends traveled from Nandgaon to Barsana, Radha’s village, to paint her and her girl gang with colors because Radha was fair and Krishna was dusky. Radha, along with the girls chased Krishna and his gang with sticks (imagining the situations? :P). 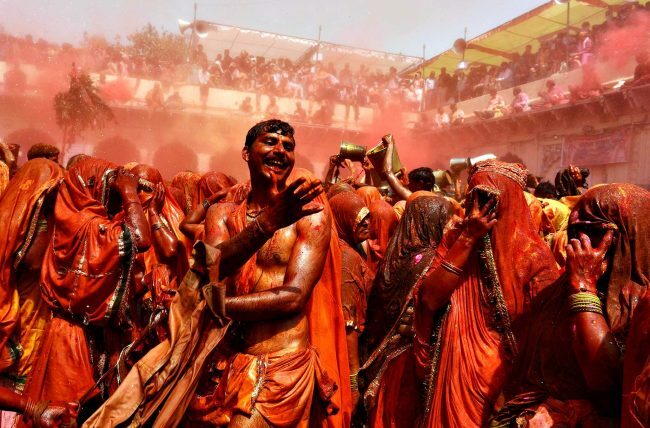 Till date, men from Nandgaon visit Barsana to play Holi with the ladies and the ladies hit them with sticks. Don’t freak out, It’s all fun and safe! Since Krishna and Radha couldn’t marry, the guys and girls of Nandgaon and Barsana till date don’t marry each other. The relation between the two villages is limited to playful holi celebration, healthy flirting only. How to reach Barsana and Nandgaon? If you are traveling from Delhi, you can take a bus, cab or train to Mathura and from there, you can take a cab to Barsana. When is Lathmar Holi celebrated? This festival is usually celebrated 7 days prior to actual holi celebrations. Confirm the date with a local person and then plan your trip. A beautiful event that takes place inside the temple premise, Vrindavan’s Phoolon ki Holi is extremely famous in India and abroad. Played on the Ekadashi before Holi, people ditch colors and water to play Holi with flowers. 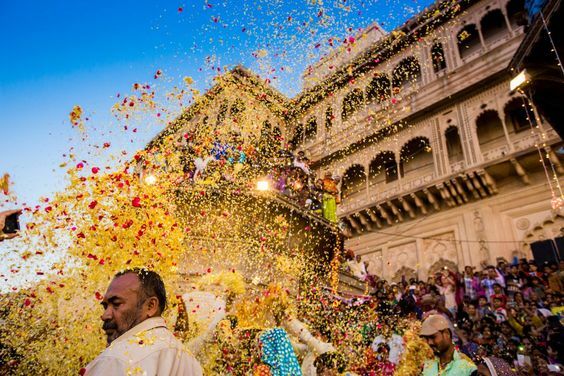 The priests at Banke Bihari temple in Vrindavan throw flowers at people as soon as the temple gates are opened. Be there to witness this beautiful event that takes places only for 15-20 minutes each year. Vrindavan is well-connected by road and by rail from Delhi, Agra, Haridwar, and Mathura. You can take any public transport or hire a cab. Where is Phoolon ki Holi Celebrated? Sure you haven’t heard about this one, ever. We all are aware of the cruel traditions that widows in India have to adopt. The widows aren’t allowed to play with colors or even wear anything colorful. A lot of times, they were also sent to widow houses in Vrindavan and Varanasi in order to shed away the worldly dreams and embrace spirituality. But recently, the widows of Pagal Baba Vidhwa Ashram in Vrindavan broke all norms and spilled colors on each other on Holi. Since then, the Vidhwa Ashram widows are playing Holi every year to add some happiness in their otherwise regular life. Do not forget to stop by and celebrate the festival with these beautiful souls. Spreading love and happiness only increases it multiple times. Do get a Holi Gift for the ladies that they will cherish forever. When is Widow’s Holi celebrated? Check with a local guide before going. The dates vary every year. 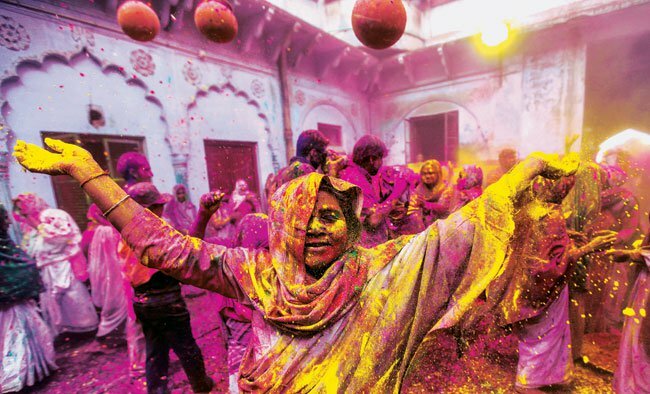 Where do Widows celebrate Holi in Vrindavan? 4. 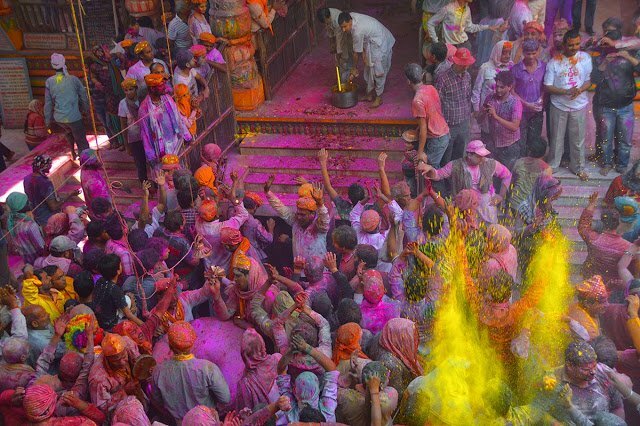 Holi at Banke Bihari – Celebrate with the Lord! Head to Banke Bihari Temple just a day before Holi. Mostly male gathering, the priest spills colors and holy water on the crowd. During this celebration, people enjoy the festival of colors by chanting the praises of Krishna in unison. This is one of the most surreal experiences to witness when people sing, dance and be with the Lord on the festival of love. The celebration here mostly ends by 1 PM. After that, head straight to Mathura to be a part of the Holi procession. Trust me, you’ll enjoy every bit of it. Vehicles decorated with flowers, people splashing colors on each other and people dancing on the roads. It’s a moment to live. The procession then gathers to burn an effigy and celebrate Holika Dahan. From Vrindavan, Mathura is just a 20 mins drive. Take any local transport and reach Mathura for the celebrations. The biggest Holi festivities are witnessed at Dwarka Dheesh Temple in Mathura. Early morning, the priests make Bhaang and by 10 AM, the celebration starts. You will find the road outside the temple jammed with people, laughing, celebrating and splashing colors on each other. Inside the temple premise, women play holi in full swing. Do not refrain from moving your body with people dancing to the tunes of Dhol played by the priests. But do not encourage rowdy behavior just because “Bura na mano, holi hai”. Be safe and be aware of people who tend to get a little rowdy. Where to go for Celebrations? When is Holi celebrated in Dwarkadheesh? Dauji Temple, located about 30kms from Mathura is the last stop for the celebrations. 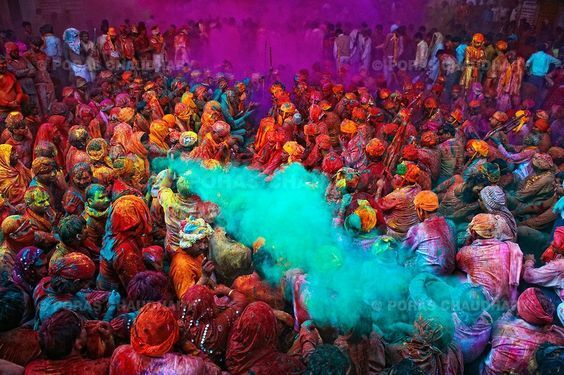 This unusual Holi celebration will leave you surprised. The day after Holi, men and women gather to end the festivities with dance and music. First, they sing traditional songs, seeking permission from the Lord to end the celebration. Later, the women of the village tear men’s clothes and beat them with their own clothes. With this, the people of Balgaon declare the festival over. Where is the Dauji Temple? A few kilometers from Mathura Dauji temple is in a village called Baldeo. Located 30 km away from Mathura, you can reach Baldeo on public transports from Mathura. Having mentioned the major details, you are all set to visit Mathura this Holi. Pack your bags with bright clothes and charge your camera’s battery because it’s going to be a great experience. But while you are in Mathura, stay safe during this highly energetic festival. Here’s a guide to how to play Holi in a safe way. Happy Holi to all you guys out there. Play hard but stay safe! GrabOn Cricket Fantasy 2019: 6 Hacks To Win Big! Top Adventure Sports Destinations in India That Will Flow In That Adrenaline! Ola Auto UK Launch Makes Waves In Liverpool! Must Visit Summer Vacation Destinations in North India! Stay Healthy This Summer With These Amazing Tips!